The Katoomba Rifle Club is one of the oldest continuous sporting clubs in The Blue Mountains, established in 1893. Meeting each Saturday shooting several disciplines including Fullbore, F-Class, F/Open and F/TR. We shoot at distances ranging from 200 yards to 600 metres at the Leura Rifle Range, about 1km east of the main street in Leura. Fullbore: This involves using a single shot target rifle in either .308 or .223 calibre with aperture sights. The ranges shot at Katoomba Range are between 200 yards and 600 metres and fullbore shooting involves using a coat and a sling and shooting in the prone position. F-Class: F-Class involves using a front rest, a rear sandbag and telescopic sights. Like Fullbore, it is shot from the prone position. There are 3 categories in F-Class. F-Standard; where the calibres used are either .308 or .223. There are limits to the projectile weights allowed. F-Open; where any calibre up to 8mm is permitted. F/TR; involving .308 or.223 but without limit to the projectile used. The Katoomba Range also hosts shotgun shooting conducted under the Blue Mountains Field Sports Association. There is one clay pigeon trap, where clay pigeons are shot using a double barrel shotgun. At the Katoomba Range it is mandatory to use steel shot during firearms practice. If you wish to get in contact with the Blue Mountains Field Sports Association, you can send an email to Don at bmfsa.inc@gmail.com. Katoomba Rifle Club shoots on a Silver Mountain Electronic Target System. These electronic targets use sensors on the target frame to detect the sonic pulse created by the projectile flying through the target. The sensors are calibrated to measure the distance to the bullet passing through the target, and show this displayed on a wifi device back on the target mound. For the most part this means that we can have a faster shooting session, without interruptions while waiting for marking. You don't need a high powered telescope to see the result of your shots. 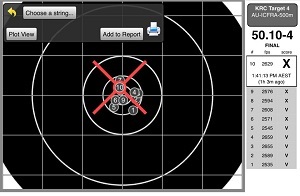 Click on the example below to see what you see as the shooter.